In 1959 Hamilton tried out a new case material of chromium plated nickel silver on a couple of models. One of them was the Sea Scout. The case material didn't work out though and both models were replaced with otherwise identical B models - with the exception of the case becoming all stainless steel. I did a post on the Sea Scout just last June but I figured I would do another post on the Sea Scout B because I happened upon a decent example with an original black dial. You don't come across that every day. 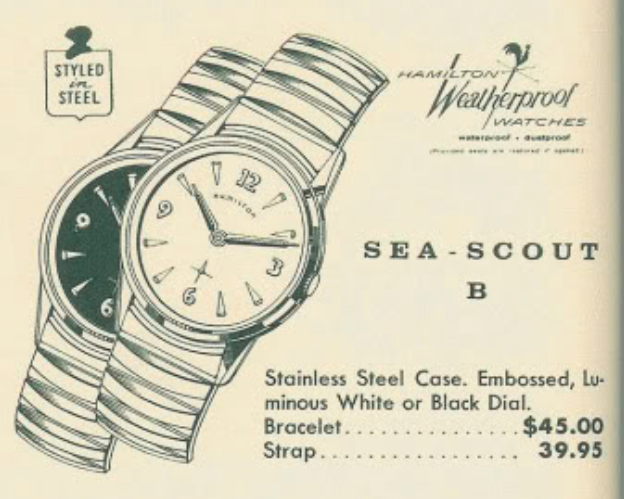 The Sea Scout B came on a bracelet or on a strap and you had your choice of either a textured white dial or a black dial. Inside the case is a Hamilton 673 movement, based on a Swiss-made A. Schild 1200 grade. My Sea Scout B arrived in the type of condition most folks would probably turn away from but it was a perfect candidate for restoration. Just a new crystal would be a nice improvement but the dial and hands needed some work too. The back is nicely engraved in celebration of a wedding anniversary between Paul and Pauli in 1962. The inside of the case back is very similar to the original Sea Scout and was made in Germany but it's not exactly the same. The movement is in good shape but obviously overdue for a trip to the spa. While everything is in the ultrasonic I will prep a new crystal for installation. Since this watch has a fairly low profile hour and minute hand with a sub second hand, I'll use a low profile GS PK-style with a 28.7mm diameter. This is considerably smaller than the crystal I installed on the original Sea Scout in June. That was 29.5mm. After the last few challenging automatics I've tackled, it's nice to see considerably fewer parts laid out for reassembly. This should be a breeze. The 673 is back to purring like a kitten with good motion. It's off to the timer. Nothing to complain about here. I'll tweak it so it's running just a little faster, as it will probably slow down over time. As I was hoping, this watch turned out great. I relumed the hands and the dial too - that brightens things up considerably. Taking pictures of a watch with a black dial is surprisingly tricky as the watch tends to show every piece of dust that might happen to land on the crystal. Paired with a fresh lizard strap, this is a sharp-looking watch. Reluming hands is very easy but applying luminous paint to the dial is very challenging. I think I did a fairly decent job on this one. That is really stunning. Great job! Thanks! It fun when they turn out well. Very cool looking watch, as always very impressive work. You mentioned that the case backs were similar but not exactly the sameness, what was the difference? The original version has a tab on the case back that aligns with a slot in the case. The B model is just a round cover. It appears, based on the case back markings, that the cases were made by different German makers... the earlier version says "RP" and the B model says "KJ". I don't know if the B model should have a white (silver) reflector ring crystal or not. The crystal that came out didn't have one. The bezel opening is definitely smaller but only by less than 1mm so that's not a huge visual difference. But it's a significant difference when it comes to proper fitting crystals.